We have two ETL products Visual Importer ETL and Advanced ETL Processor. 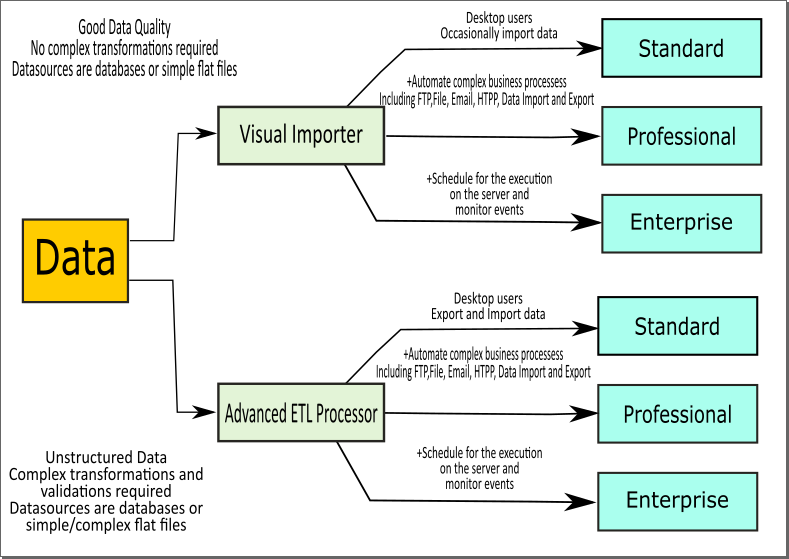 If you just want to load data from a table, delimited file or simple XML file choose Visual Importer ETL. If you work with complex data and require data validation, transformation or sorting and on top of it you also want to be able to generate the data select Advanced ETL Processor. Standard Edition is designed for the desktop user who just wants to run data load or transformation manually. Professional Edition is designed for a user who wants to execute business automation processes manually (Developers). Enterprise Edition is designed for a user who wants complete automation of business processes. Visual Importer ETL is the first software product we created. Since then we have designed Advanced ETL processor which is fully compatible with it and has much more features.